Forks Over Knives is a book based on the documentary of the same name, advocating the benefits of a whole foods plant-based diet. It was written by Dr. T. Colin Campbell and Dr. Caldwell B. Esselstyn, Jr., who are both specialists in the prevention and reversal of chronic diseases through dietary adjustment. The authors have dedicated their lives to researching healthy diets and claim that a diet based on whole foods like fruit, vegetables, whole grains, and legumes can save you from heart disease, cancer, and diabetes. According to the authors, eating foods like meat, eggs, dairy products, and oils, is responsible for the development of cancer, heart disease, and strokes. Based on their research they are recommending that everyone eliminate these foods from their diet completely. The diet is comprised entirely of plant-based whole foods including fruit, vegetables, whole grains, legumes, nuts and seeds. The authors highlight the importance of whole foods, stating that a diet of potato chips, pretzels, vegan pastries, and diet soda may technically be a plant-based diet but it is certainly not a healthy diet. They point out that foods like cakes and cookies made with white flour and refined sugars cause blood sugar imbalances and weight gain. However, when you eat whole-plant foods like fruits, whole grains, and vegetables you will thrive, even though this is a high carbohydrate diet. Forks Over Knives also contains inspirational stories of dramatic health recoveries on this program, tips on how to transition to a plant-based diet and 125 recipes. Fruits, vegetables, mushrooms, beans, chickpeas, lentils, quinoa, oats, whole grain bread, rice, avocado, nuts, seeds, coconut, olives, soy milk, oil-free salad dressings, maple syrup. 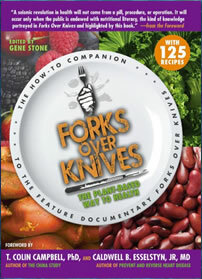 Forks Over Knives: The Plant-Based Way to Health retails at $13.95. Encourages a high intake of fresh fruits, vegetables, whole grains and legumes. The health benefits of a plant-based diet are well supported by scientific research. Provides tips to help dieters make the transition to a plant-based diet. Success stories of other dieters can give motivation to follow the program. Some dieters may prefer not to completely eliminate animal products. Will probably require more time to be spent on meal preparation. Does not mention the negative health effects of caffeine and alcohol. The book does not include exercise recommendations. The information provided in Forks Over Knives is based on scientific research and many have achieved success on this program, recovering from chronic conditions including heart disease, hypertension, and diabetes. It serves as a guide to help dieters make the transition to a whole foods plant-based diet and includes tips and recipes to get you started with this way of eating. Although it is not specifically designed as a weight loss diet, most people find they effortlessly lose weight, due to the high fiber and nutrient content of the diet that naturally encourages a healthy appetite. Campbell, T. C., Esselstyn, C. B., & Popper, P. (2011). Forks over knives: The plant-based way to health. G. Stone (Ed.). Workman Publishing.